"Age Is A State Of Mind, Here In The Northern Forest!" Yes, age is a state of mind, in the video above, Indigo the Leader on the right is 9 years old and still a top performer. It is just an example that dogs well looked after and not raced too young can perform well into their later years. This is team "B" and they are starting to come together. Olive is the Leader running left and although she is behind in total miles run as compared to the others, she doing great and feeling very comfortable in her new surroundings. We were able to run only three days this week due to rain on Friday and an emergency shopping trip to the village on Monday (needed a new stove). This week, week ran three days in a row with the "A" Team running a 10.5/7.5/4.4 mile runs. The "B" Team running 2x7.5 and one 4.5 mile runs as Olive has not enough miles on her yet for the 10.5 yet. The puppies are growing big with their eyes open and have started to get up on their feet to walk. They are eating/sleeping and eating again. Poor Flaire is getting little rest. "A week Of Extreme Temperatures Here In The Northern Forest!" From -30 C to +2 C overnight this week! Another busy week here with 4 days of training and looking after the puppies. The training here was very good with great trails and an opportunity on Thursday to increase the speed for Team A on the 7.5 mile run. They finished strong and showed no signs of fatigue after the run. Team B also done well with a little slower run due the lack of training miles on Olive. Olive has of the last run 100 miles of training this year as compared to the balance of the dogs with 150 miles accumulative. We also did some more leader training with Lilly, Lance and Libby. Lilly will now be running half the training runs with Venus at the lead position. She is doing great and will make a supper leader. Lance ran for 1/3 of the 4.5 mile run with Kira and was much more comfortable at lead. He has a good potential for lead and was a good complement to Kira. Libby ran for half the 4.5 mile run with Kira and did a great job. She is showing the ability to be a very good leader. She sometimes gets a little distracted by objects on the side of the trail. But, she is driving hard up front the same as at the Point position. The puppies are growing and getting more active. Their eyes opened the later part of this week and are trying to walk. They are eating a lot and growing quickly. Fun times here with lots of activity. "Another Busy Week Here In The Northern Forest!" Another adventurous week here at Miortuk with Faire, the female being boarded here to have her puppies' delivered them a week premature. Of the six puppies born only three survived. However, the three (two males and one female)that survived look healthy and have already doubled in size. Due to the fact that it was a premature birth Flaire didn't have enough milk to nourish all of them and had only 4 teats that developed with milk. Unfortunately the loss of the three puppies is Nature's way of ensuring the survival of the fittest. It is always hard to suffer the loss although we did everything possible to assist in their survival. Flaire and her puppies are doing good and eating well. Mother and puppies are inside the chalet to monitor their development and keep them warm. This week, we also got in three training runs with both teams (2 at 7.5 miles and one at 4.5 miles). We have discovered that Venus runs much better at lead with Lilly. Although Lilly is just a beginner at Lead, she is showing that she is a Natural Leader and enjoys the opportunity to be up front. Libby had a short run at Lead with her sister Lilly and showed good portntial for becoming a Leader. 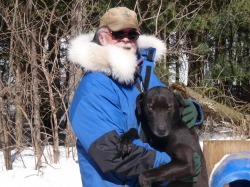 Part of mushing is learning to pair dogs that helps bring out their best. It is like fine tuning a race car! The weather here has turned very cold last night with the night time low of -30 Celcius. These low temperatures are to stay until next Wednesday. "An Exciting Week Here In The Northern Forest!" This week was an exciting week with working with a new Leader, increased mileage with training and awaiting a delivery of some new puppies. Last weekend a decision was made to assist another musher with the birthing of a litter of puppies from Flair in exchange for obtaining a 3 year old race Leader Olive. This week, we had Olive run on 4 training runs with our second team. First run in the team to get used to her new team mates and then up at Lead. She did very well and showed more confidence on the 4th day of training in the lead position. This week, we increased the mileage on the runs to 71/2 miles. The teams handled it well and were not tired from the longer run. For the next couple of weeks, we will alternate the distances run with a longer run the first day after a day off and then a shorter run on the second day. The longer runs will be at a slower speed and the short runs will be a speed run. The trails here are perfect with nice packed snow. Daily the trails are groomed. Both Olive and Flair arrived here last Sunday and had a week in the kennel with the other dogs to get socialized. We moved Flair into the whelping pen on Saturday and are now awaiting the arrival of her puppies. All indications are the puppies will be delivered soon. Now is the waiting period and making the mother to be comfortable as she goes through her labor. The video above is with Olive/Yoda turning the team into the extension loop.